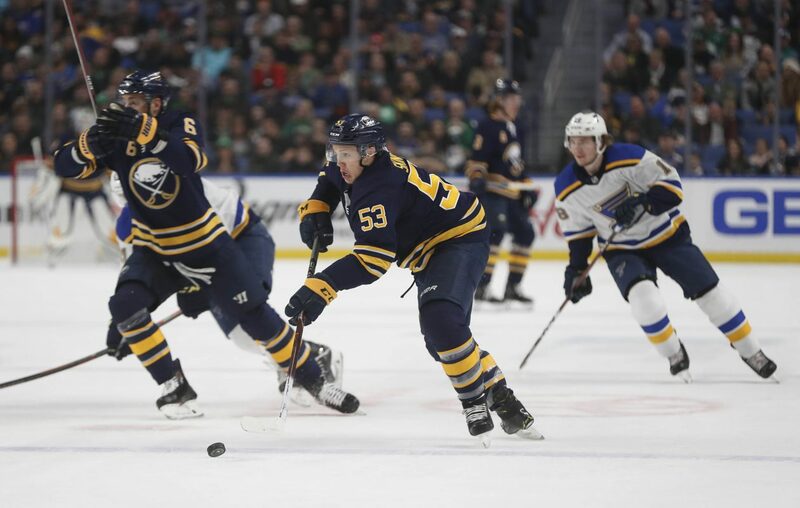 Lance Lysowski's Sabres mailbag: Another roster overhaul this offseason? More changes will be made to the Buffalo Sabres' roster this offseason. The only question is what sort of steps will General Manager Jason Botterill take to address their deficiencies. Entering Monday night's games, the Sabres had the second-fewest points (35) in the NHL since winning their 10th game in a row Nov. 27, scoring the fifth-fewest goals during that span. Their inexperience has shown at times, however, there is also a need for more scoring help and they have under-performed defensively. Chris Segato asks: How can the coaching staff cure the softness and inconsistent 60-minute efforts? Lance Lysowski: Softness isn't on the coaching staff, in my opinion. Part of the problem is personnel. The Sabres have some high-skilled forwards, but this is a small team that struggles to win battles in front of the net and along the boards. They need to get bigger and more physical through roster changes. Coaching and personnel are responsible for those inconsistent 60-minute efforts. That has to be coach Phil Housley's focus entering the offseason. There's no reason why the Sabres should have the type of lulls or meltdowns that have plagued them since November. Also, it's up to the players to work hard when they're on the ice. Coaches shouldn't have to motivate them to do that. Mike asks: Will Jeff Skinner want to return next season? LL: Skinner isn't going anywhere. Though he has not said much about ongoing contract talks, he has made it clear how much he enjoys the players in the locker room and this roster's potential. Plus, much of his family lives in the Toronto area, which also happens to be where Skinner trains during the offseason. A deal will get done. Joseph Gianturco asks: Are both goalies on the roster next season? LL: I can't imagine the Sabres parting with Carter Hutton or Linus Ullmark. Both have shown at times they can succeed as the starter, though consistency has been a problem for much of the season. Hutton is under contract for two more years, while Ullmark won't receive much of a raise as a restricted free agent. The Sabres are more likely to change how both prepare for games, meaning a different goaltending coach. Svoktish asks: Will Jason Pominville return to the Sabres on a lower annual cap hit? LL: Pominville would love to return, but I don't see that happening. His leadership and propensity to go to the net are two characteristics the Sabres need more of, however, they also need bigger forwards who can forecheck. Plus, Alex Nylander is showing he might be ready for a full-time role in 2018-19, though it's too soon to make a call on the 21-year-old. Mark asks: Do you believe Botterill is the right person to be the Sabres' GM? LL: Yes. A person in his position deserves more than two seasons to fix an organization. Tim Murray's drafts and trades decimated the Sabres' depth, particularly up front. The optics of the Ryan O'Reilly trade aren't great for Botterill since neither Tage Thompson nor Vladimir Sobotka has made much of an impact. Remember, Patrik Berglund was supposed to provide around 20 goals, win important faceoffs and provide the type of toughness this team lacks, but he chose to leave the team because of an ongoing battle with depression. Botterill could not have projected that. The first-round draft pick acquired in the trade helped Botterill acquire Brandon Montour. I'm going to withhold judgement until I see how Thompson develops over the next 12 months. Again, Skinner doesn't come to Buffalo if O'Reilly isn't traded because of the salary cap. The Sabres aren't in the business of acquiring rental players and it's unlikely they would invest so much of the salary cap in three forwards: O'Reilly, Skinner and Jack Eichel. I want to see how Botterill addresses the lack of depth and grit up front. He'll have the cap space and assets to show if he's the right man for the job. This is a critical offseason for him. Joe asks: Who are the Sabres' most prominent prospects in college hockey, junior hockey and overseas? LL: Ukko-Pekka Luukonen is their best prospect in junior hockey. The 20-year-old goalie led the Ontario Hockey League with 38 wins to help Sudbury reach the postseason and recorded a team-record six shutouts. He also won a gold medal with Finland at the World Junior Championship and is expected to join Rochester this spring. Forward Matej Pekar was having an outstanding season in Barrie before breaking his collarbone, though he still has 14 goals among 36 points in 33 games. Defenseman Jacob Bryson, a fourth-round draft pick in 2017, is having another big season at Providence College with 25 points in 39 games as a junior. Defenseman Mattias Samuelsson, a second-round draft pick last summer, has performed well during his freshman season at Western Michigan, though he's still at least another year away from turning pro. Defenseman Oskari Laaksonen is arguably the Sabres' best overseas prospect and performed well for Finland in the World Junior Championships. He is only 19 and his selection in the third round in 2017 surprised many, but Laaksonen has 24 points in 46 games for Ilves. Lefty asks: Who is left after the upcoming offseason purge of the roster? LL: As mentioned above, I believe Skinner stays and Pominville won't return. Of course, Eichel, Sam Reinhart, Casey Mittelstadt and Thompson aren't going anywhere. The same can be said for Conor Sheary and Kyle Okposo. Botterill will have decisions to make with his bottom-six. He will surely bring back Evan Rodrigues, who will receive a significant raise as a restricted free agent. Johan Larsson and Zemgus Girgensons are also restricted free agents, but I don't think both will return. The Sabres need to add some toughness and scoring to the forward group, and neither player has provided those with any sort of consistency. Again, Botterill is hamstrung by a few bad contracts. Of course, Sobotka would be the obvious player to remove from the roster, but he's under contract through next season and won't have any suitors on the trade market. Brandon Montour, Rasmus Dahlin, Casey Nelson and Zach Bogosian will be back on the blue line. While Marco Scandella, Rasmus Ristolainen and Matt Hunwick are under contract next season, I am of the opinion that Botterill will shop them this summer. That said, I'm not convinced they will trade Ristolainen, despite his minus-37 rating.